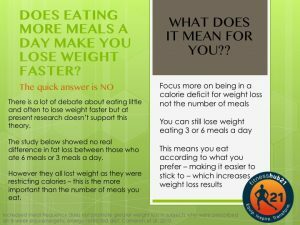 A get asked a lot about how many meals a day are needed to lose weight. My reply is simple, as long as your following a calorie restricted diet; whether you eat 3 meals or 6 you will still lose weight. This allows my clients to be free to choose how they eat during the day as long as they stick to the calories i have prescribed for them.